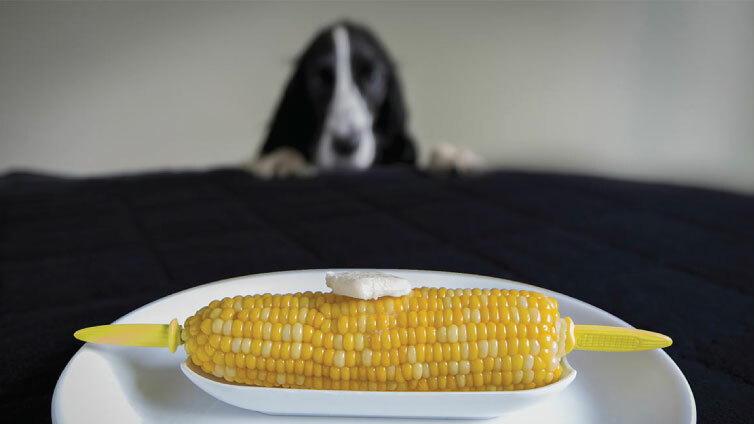 Food that is healthy for us may not always be healthy for our pets too. In this comprehensive guide you will learn which foods are bad for dogs. Which human foods are toxic to dogs? Food that is healthy for us may not always be healthy for our pets too. Grapes and raisins are healthy low calorie snacks for people, but even small amounts could be fatally toxic for a dog. Except for almost surely causing diarrhea, grapes and raisins could also cause kidney failure to your dog. Even scientists are not sure why that is, which means we don’t have a precise explanation for it, but we’re definitely recommending avoiding this fruit in your dog’s diet. And we also believe your dog won’t mind it. Macadamia nuts are definitely dangerous, so you should never give them to your dog. They contain substances which could make your pet ill, even when given in small amounts. Poisoning is the first thing that’ll happen, leading to other problems that can get really serious. This food is one of the few that should be avoided completely. We all know that bacon might be harmful even to humans, but you should never give it to your dog, no matter if you’re convinced that it’s not dangerous. Bacon can cause pancreatitis in your dog’s organism and also problems with digestion. Not even to mention that it’s often way too salty and seasoned, and that’s something prohibited to all dogs. When eating apples, you’re aware that you should avoid pits, but your dog isn’t. So, if you have an apple tree in your yard or you know that your dog is excited when chasing apples, pay attention to it: pits and cores can be extremely dangerous to your dog, because they might become toxic during the digestion process. While being digested, mushrooms have big potential becoming toxic in your dog’s stomach. That’s why you should definitely avoid it in your dog’s diet – they can cause vomiting and stomach pain that can have longer effects. All in all, mushrooms are something that should be absolutely prohibited when it comes to your pet. Although this fruit is super-healthy for boosting your metabolism, it’s harmful to dogs. Avocado has a substance called persin, which most of the dogs are allergic to. So, it would be the best if your dog could avoid this plant completely, even its leaves and tree. Pay good attention if you ever have a walk next to it. All of the milk and dairy products are not actually dangerous for dogs, but they can sometimes cause stomach problems, so it’s not recommended for them to take them. Dogs are not as lactose tolerant as we are, so their organism reacts to it differently from ours. However, not all of them are allergic to it, so they can sometimes be treated. For more details, here’s an article on can dogs drink milk. Feeding your dogs rhubarb leaves or letting them eat it by accident is definitely something that should be prevented – substances from this plant could mess up your pet’s urinary, nervous and digestive system. We know that this is not the no. 1 ingredient when it comes to your dog’s diet, but we think we should still warn you about it. By this we mean salty food, especially snacks – we know that your dog is probably dying to try it every time, but you should learn how to make him resist. Salt can cause dehydration and diarrhea, but also some more serious things, like depression or high body temperature. So keep your dog away from it, just in case. We’re not thinking about dog medicine, of course, but if you give your dog some of the human medicine, it could turn out to be fatal. Although there are some of the medicines that could be given both to humans and dogs, you should never take one on your own and give it to your pet without consulting a vet – you could end up being terribly wrong. We’re aware of the fact that you’re not giving your dog coffee to drink every morning, but we’re trying to warn you that you should never let your dog lick coffee that’s spilled on the floor. It can cause vomiting and stomach pain, and also some changes in the nervous system – so pay attention your dog doesn’t get in contact with it. This substance is actually a sweetener that’s used in several products, like candy and baked sweets. Dogs are especially sensitive when it comes to it, because you’re probably aware how much sweet things are harmful for them. If they accidentally take something that contains xylitol, they’re probably going to be OK, but bigger amounts of it are very dangerous. Substances contained in these vegetables become toxic once they enter any dog’s organism, because they can’t digest them. So, don’t do it in any case, because it’s a big risk. In the best case, it’ll cause only diarrhea, but it could get much worse than that. It seems like not all vegetables are healthy, at least when it comes to dogs. Although some consider them to be healthy for humans, mustard seeds could cause problems to your dog. Luckily, vomiting is the most dangerous thing that could happen, but we believe you wouldn’t be glad to see that either. So keep your dog away from the mustard seeds – and we’re sure you won’t have any big trouble doing that. Iron could harm your dog’s organism more than you could imagine – it’s very toxic for them. Their liver and kidneys could be damaged by taking some of the vitamins meant for humans. Just like it was the case with medicines meant for human, it’s basically the same thing here – never try to help your pet on your own, consult a vet first. Another plant that should definitely be avoided in your dog’s diet is hops. It can cause stomach pain, but also some more fatal things, like high body temperature, increased heart rate, and all that could lead to the worst. That’s why your dog should stay away from it always and in any occasion – you can never be cautious enough when it comes to this. Just like many other fruit pits, there are different opinions on whether to eat them or not. When it comes to your dog, it’s recommended to avoid it for possible cause of poisoning. However, it doesn’t have to happen necessarily, so don’t freak out if your dog ate few of those. Just keep in mind that it might be dangerous in bigger amounts. You might think that bones are a real treat for your dog, but if it’s not used to it, you shouldn’t feed it with bones – they could break in little pieces that could get stuck into dog’s throat. Raw meat is also not recommendable because it might contain some of the bacteria that could harm your pet. However, if you’re sure about it, you could give it in small portions. The large amounts of acid in these plants could cause stomach irritation in bodies of dogs. Having in mind they’re not used to acid at all, you should really be careful if you have any citrus trees in your yard or neighborhood. However, if your dog takes small amounts of it by accident, don’t worry; it won’t cause any great harm. Read more in depth article about eating citrus fruits. One of the most dangerous things you could give to your dog is alcohol, having in mind their sensitive organisms. Alcohol can cause damages of the nervous system and changes of behavior, but also digestive issues and losing consciousness. We don’t know under which circumstances anyone would give alcohol to his dog, but it’s strictly prohibited. Feeding your dog with coconut probably won’t cause any serious harm if given in smaller amount. However, if you’re feeding it with coconut often, you should pay attention to your dogs stool – it might cause diarrhea and stomach problems. That’s why we’re recommending offering small amounts of it to your pets. We’re all familiar with the fact that nuts contain high amounts of oil and fat, so that’s what might cause problems with dogs’ stomachs. Your dog will possibly have troubles with vomiting and pain, and also diarrhea, so we recommend you don’t feed it with nuts. However, if you give it a bite or two, it surely won’t do any harm. Can Dogs Eat Peanuts, Almonds and Pistachios: Find out here. Although we’re assuming you’re not giving any moldy foods to your dog, we still have to repeat how important that is. Some dogs might handle it well, but those are usually non-domestic dogs. It can cause pain in its stomach and irritation of it, and we’re sure you don’t want to do that. So keep your dog away from smelling garbage, although it probably loves it. Yeast dough could be dangerous for your dog due to several reasons – first, it can grow inside of your pet’s stomach and cause pain; and second, it could be digested and turned into alcohol, as mentioned before. This food is just another one that is harmful only if given in large amounts, so don’t panic if you dog accidentally take a bite of it. We know that marijuana isn’t something you consume on a regular day basis, but you should definitely be careful with it. Even eating its plants can cause your dog to become depressive and have problems with the nervous system. Even if marijuana is something that relaxes you, it’s definitely not the same case with your dog. You’ve probably heard before how chocolate could make dogs go blind, and it’s not a myth. That happens because of sugar that’s contained in it, but there’s another dangerous ingredient, called theobromine that’ll cause vomiting and stomach pain to your dog. That’s definitely a good reason for dog owners to avoid chocolate. The most dangerous part of peaches and plums are its pits. Your dog could possibly swallow it and choke on it, but only that – pits contain a substance that could irritate their stomachs and that could be poisonous. Many dogs are not really fan of fruits, but if your dog is, give it peaches and plums in small amounts with pits taken out. If you’re taking good care of your dog, we recommend you never give it table scraps. First, they can be consisted of everything we’ve mentioned on our list. Second, and more important, table scraps are always salty and there’s always much fat there – so if you put aside something you wouldn’t eat, don’t feed your dog with it either. Raw eggs are usually dangerous for the same reason as raw meat – it could contain bacteria that cause poisoning, but not necessarily. However, there’s another problem with your dog eating raw eggs – it’s digested in a specific way that absorbs vitamin B, which means it could cause biotin deficiency. This could result in skin problems and loss of your dog’s hair, so better avoid it. Just like some of the ingredients we’ve mentioned before, fish can also carry bacteria in it. However, fish is especially dangerous for causing diseases that can be carried only by them, and there are no specific signs of it, except from vomiting and diarrhea. Each of these threats could possibly lead to death, so we believe you wouldn’t want to take the risk. Just like children, dogs are also highly recommended to be outside smoking spaces. Despite being bothered by the smoke, nicotine can increase their heart rate and lead to more dangerous things. We know that it’s impossible for the dog to literally take tobacco, but try to be more cautious when you go for a smoke. Here we don’t mean only seasonings could be harmful, but everything found on your kitchen shelf – like baking powder, baking soda etc. It’s recommended for your dog to avoid even food that contain some of those ingredients and especially to stay away from taking it raw – you’re the one who’s in charge of that never happening by accident. We all know how food-motivated all the dogs are – just make a sound of taking something out of the bag, and they’ll be there waiting to be treated. However, if you own both a dog and a cat, be careful to never mix their foods – it could end up badly. Cat food contains much higher doses of protein and fats, which could harm your dog. Click here to find out is broccoli safe for dogs? Hope you found this article interesting. If so, feel free to spread the word! Can Dogs Eat Ice Cubes? Can Dogs Eat Cauliflower, Broccoli, Cabbage and Kale? I read about the recommended foods not to feed your dogs however I disagree with some of your assessments Fish for instants is the main staple for the northern sled dog. I have also fed my dogs raw eggs mixed with uncooked oatmeal to bring a thick healthy look to their coats.